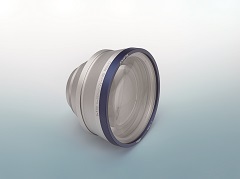 Jenoptik will display its new full quartz crystal lens, the F-theta JENarTM SilverlineTM170-355-140. The lens has a maximum telecentric angle of just 4.9 degrees and a highly homogeneous spot size distribution across the whole of the 100 x 100mm work area. This large processing area, in combination with the diffraction-limited image quality, allows for increased throughput in comparison with standard lenses available on the market. Its use with high-powered lasers and ultrashort pulses is also possible, due to the high damage threshold of the lens assured by the quartz material and optimised coating.